For my ethnography of the online space r/traaaaaaannnnnnnnnns, I chose to take a somewhat indirect approach. Instead of posting questions and engaging directly with users for the data collection portion, I instead studied what they posted in the space. By using the statistics that calculate the popularity of certain posts, upvotes, I kept track of the daily most popular posts to look for through lines in either content or format. Using that information, I created a “super-post” that is meant to be a culmination of all of the most popular trends that I studied. The idea behind this post is to create a post that will be able to quickly garner a large amount of upvotes by replicating the most popular posts that I had reviewed. An interesting variable that arose during the study was the fact that Transgender Day of Visibility fell during the days that I was doing data collection. This means that the data is a bit skewed since one day was made almost entirely of posts about that particular holiday. Despite this fact, many of the most popular votes still aligned pretty well with one major theme that I observed, that of still being in the closet while other trans people are out. 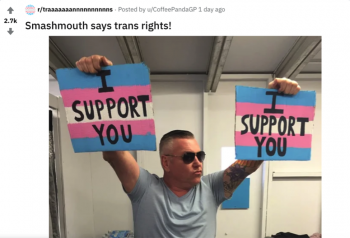 Another popular theme was one in which figures from either popular culture or other circles were being reposted with their messages of support for trans people. I’ve included a sample post to help illuminate this below. Beyond these two rather specific trends, the rest were very much on par with the usual posts on the site. 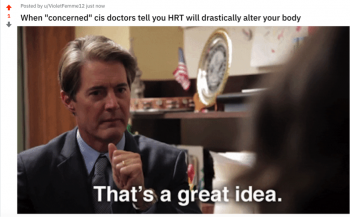 Common themes to appear in a daily top ten were posts about HRT(hormone replacement therapy) which had an average of three posts per daily top ten, “cis nonsense” realated posts had an average of three posts per day in the top ten, posts about still being in the closet, which averaged two posts per daily top ten and the final prominent theme of posts about trans people being included in feminism which were about two posts per daily top ten.